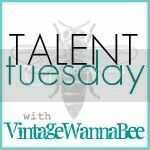 Thrillingly Thrifty: T Shirt Bags - How-to! Yesterday I posted about my T-Shirt bags adventures, and last night I whipped out another one for a Service Auction at church tonight, so I tried to write down what I did and take some pictures along the way. I hesitate to call this a 'tutorial' because it is nowhere NEAR as good of instructions as most tutorials out there, but hey, its my first one! 2009 on it, so I figured I wouldnt be wearing it again much. MY ADVICE: if you're following the measurements I give, you're probably going to want to use an Adult L or even bigger. This was a Women's L, and I was scrounging for pieces. I really like to use Men's XL shirts - you can get two smaller bags out of those pretty easily, or a bigger one but with a lot easier measuring and cutting. -(2) Rectangles 12" by 14" You can't tell in the picture, but I cut the rectangles' short side (12") along the bottom hem of the shirt - try to do this if you can! It saves time and looks kind of neat. -(2) Handles 14" by 2"
-(2) Strips for Ruffles 2.5" by 24"
Some quick notes: the handles should be wider (and you'll see why in the next step) and I would have liked them a little longer, but you gotta work with what you've got! I wish I could show you exactly where from the T-Shirt I cut each piece out, but other than having the rectangles line up along the bottom hem, the pieces were kinda all over the place. And each bag I've made has been cut out slightly differently - so I dont think there's a right or wrong way. I just try to cut both ruffles the same (either running vertically on the shirt or horizontally on the shirt) and both handles the same; if you don't the pieces might sew different and look mismatched. The easiest way to make the handles is to take one handle, fold it in half with the right sides together, sew the long end, then turn it right-side out. But like I said above, I didn't have enough fabric to do very wide handles - I think you need them to be at least 3 " wide, although I prefer closer to 4". Otherwise, its VERY difficult to turn them rightside out. So here's how I made these handles, and I just want to say now that it was NOT a very easy way to do it. I'm sure someone else out there has a better way to sew these things. 1. Press the bottom edge up so that it hits about the middle of the strip. 3. Stitch down the center. 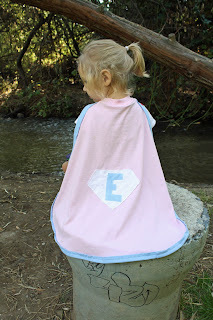 Your goal is to be sewing both overlapped pieces, and hopefully still be in the center. 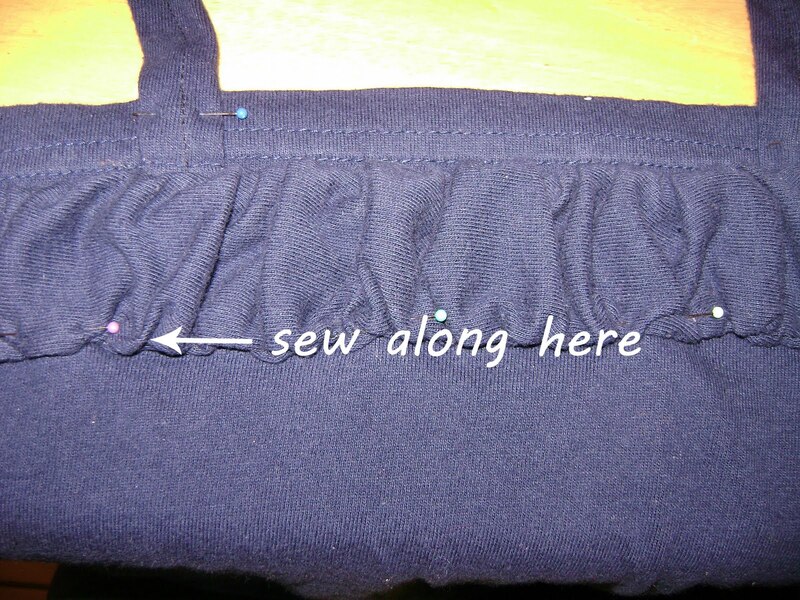 You may want to pin the flaps in place a bit before you start sewing, since it tends to move easily. Like I said, definitely not the best way to sew handles, but you gotta do what you gotta do. I moved my needle to the right, put the tension at the highest setting, and then chose the longest stitch length. Now, each shirt sews a little differently; for some of my other bags the highest tension setting ruffled it just right so I didn't have to adjust it much when I was lining it up with the rectangles (you'll see in the next step). For this one, it ruffled it just a bit too much, so I ended up turning the tension down to '8' and it worked great. My advice is to make sure to leave long enough thread 'tails' to allow adjusting. Pin your handles to the RIGHT SIDE of your rectangle; the side that will be the outside of your bag. (If you were able to use the bottom hem of the T Shirt for your rectangle, that will make it easy to tell which is the right side. Oh, if you couldn't/didn't use the hem, you might want to sew a quick hem on the 12" side of the rectangles at this point. It looks nicer that way.) 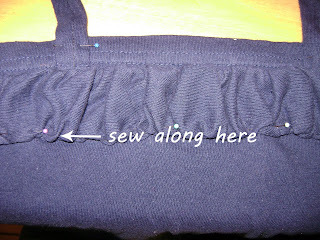 The bottom edge of the handle should extend 3/4"-1" past the stitching of the hemline. Stitch straight across the bottom of the handle. 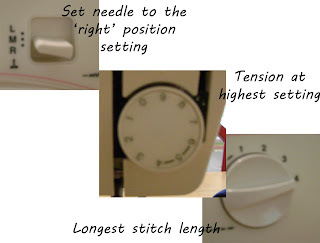 (Make sure to change your tension and stitch length back to normal.) I even backstitched over it, just to make sure. Do this for both ends of both handles. Okay, now comes the part that I may have trouble explaining, especially since I didn't take as good of pictures as I thought I had. Bear with me. Place your ruffle on top of the rectangle with the right sides together. Line up the stitching where you ruffled just below the hem of the T Shirt. 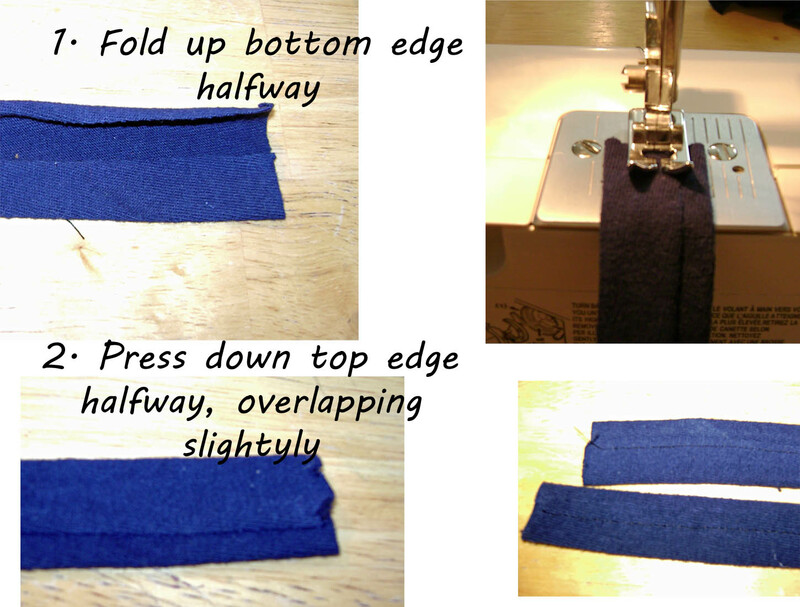 Pin this ruffle in place; and don't go stingy on the pinning! Its better to have a few too many than a few too...few. You can't really tell, but the ruffle extends above the hem, and also you're seeing the "wrong" side of the ruffle. I know, they look pretty much the same, but up close there is a difference! Also, try to let the ruffle extend over the side edges a bit; I didn't get a good pic of this, but when you sew your two rectangles together you want them to be long enough to 'catch' in the seam. This is where having those thread 'tails' comes in handy, you can gently easy out the ruffle a bit to make it long enough. Okay, now you're gonna sew this baby on! I didn't take any pics of this, so I'll try to just explain. 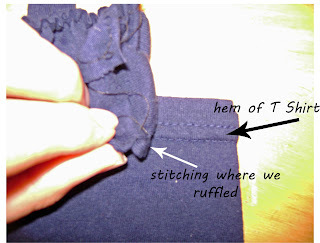 You're going to sew along the bottom edge of the ruffle, just on the other side of the stitching you have from ruffling. See the white dotted line? That's where you're going to sew. And the gathering for the ruffle is right below that. Okay, now you fold the ruffle down, so that the right side is now facing up. You can press it down with an iron if you like, although I've done it without and it was okay too. Turn right side out, and you're done! Unless of course you want to decorate it...then you're just getting started! 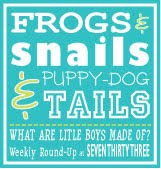 Click here to see my post yesterday. It shows a couple little variations, plus the lovely painting my two year old did! Great tutorial! Especially the ruffles! Love all the pics and explanations. 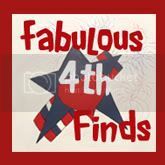 Would love for you to stop by Thursday & link this up to Fab Finds for the Fourth. It's be great for 4th of July, don't you think? love this bag! Gonna ty soon. Thanks for linking up today! Hope to see you next week too! Nice tutorial. Wish I didn't have to be in the "mood" to sew. I should so it more often, but just don't feel it. Fabulous tutorial!! This bag is so darling! Thanks for sharing! Very cute! I have a bunch of old shirt that would be perfect for this. Adorable take on the T-Shirt Bag.